Imagine the year is 2014. We’re in the midst of an era when lots of cities across the US are working hard to promote cycling. By many counts it’s never been easier to ride a bike. Our family was already three years into getting by with just one car – this would not have been possible without the ease of cycling in my hometown of Carrboro, NC. During and since that time many major cities have implemented lots of cycling initiatives to build new bike lanes, make more areas accessible by bike, and created bike shares to make it as easy as possible to bike. So what would have been your prediction in 2014 about what US bicycle commuting numbers would look like over the next three years? I think it’s safe to say we’d be haggling over how much of an increase in bicycle commuting there would be in 2014-2017. 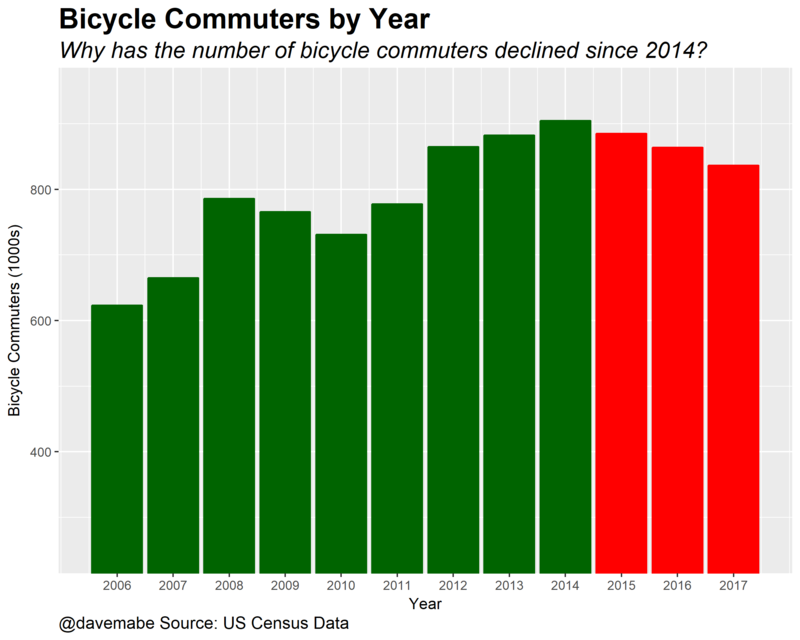 This makes it even more striking that the number of people commuting by bike in the US has steadily decreased since 2014. 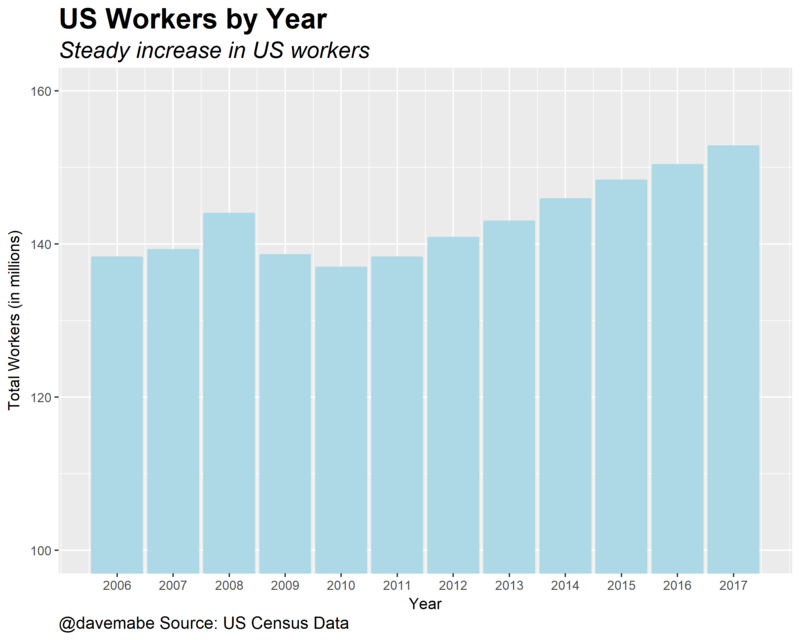 This is over a time period where the total US workforce has steadily increased, so in percentage terms the cycling numbers are even worse than the chart above appears (down from a peak in 2014 of 0.62% to 0.55% in 2017). 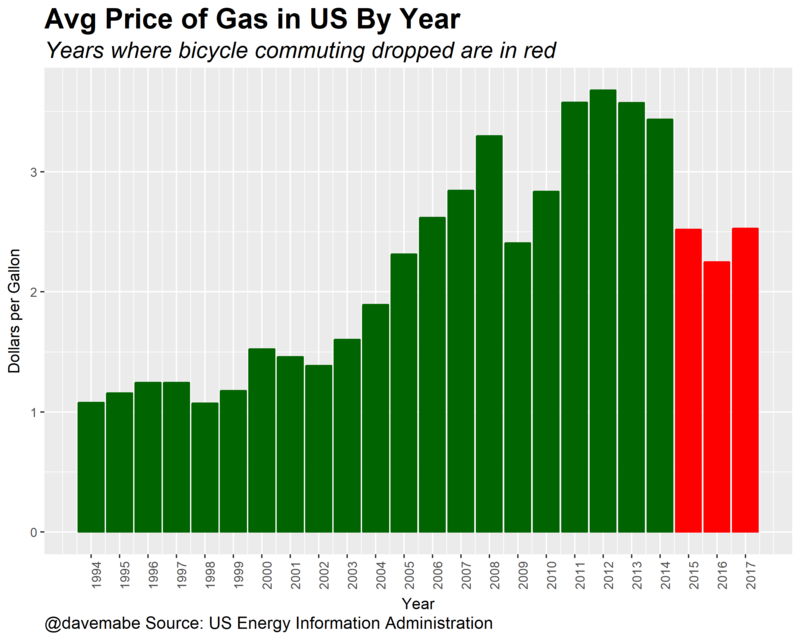 So why has this drop in bicycle commuting occurred? I can’t say for sure, but here are some theories about what might be playing a role. The percent of US workers commuting by car (alone or carpool) has remained remarkably consistent – it’s currently 85.3% of the workforce. Commuting by public transit is down in percentage terms from it’s peak in 2015 – 5.232% then and 4.998% now. As much as people complain about traffic congestion, it’s apparently not enough to change people’s behavior too much. US gas prices are close to their lowest in a decade, making driving relatively more attractive at the margins. 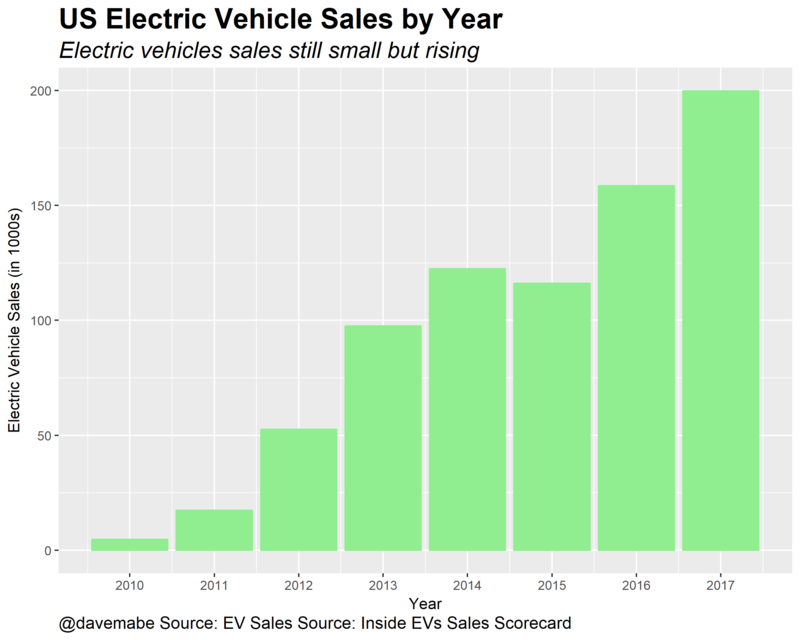 Electric vehicles continue to become more widespread in the US. When you think about the target market for these vehicles, a significant portion of this group might also consider biking to work. It’s becoming easier to signal environmental consciousness AND drive a stylish car. I suspect this is crowding out some would-be bicycle commuters. If the percent of the workforce that is commuting by car is basically unchanged and the percent of transit use is down, what’s left? It turns out working from home has been quietly exploding. After a four year run of basically no change from 2008 through 2011, there have been solid increases and now it’s up over a third from 2011. In fact 2017 was the first year where more people work from home than commute by public transit. This occurred during a period of lower gas prices – seems reasonable to assume that these numbers are positively correlated. That is, if the price of gas were higher over the last 3 years or in the future, these work from home numbers likely would be higher still. Another theory that seems like it might be true is that kids of so-called helicopter parents are coming of age and entering the workforce. I expect there’s not great data to look at for the “helicopter-ness” of the last couple decades, but it certainly seems to be true that safety (over) conscious parenting has increased dramatically. (Here’s a daycare that’s suggesting kids wear helmets for recess, for example.) It’s hard to deny that this has been the case and in fact we’re starting to see responses to this problem. The time period for the decline in bicycle commuting also might roughly coincide with a generation of safety conscious kids entering the workforce. Will kids of this generation be more of less likely to commute by bike to work? The answer seems obvious. Predictions on Bicycle Commuting in Next 4 Years? Anyone willing to offer a bet on what future numbers of bicycle commuters will be in the census data? If so, contact me. Does “hat tip” count as “you are right,” those three little words I love to hear? Not quite but pretty close, Joan. I hadn’t thought about that Brendan but you’re right that probably is a factor. Ebikes could have a positive effect on commuting as a wave is coming to the US. Thanks for the post; this is discouraging, and it’s worth looking into the reasons underlying it! Where can one find the data that went into your first graph? (I know it says “US Census Data,” but there’s a lot of stuff there and it’s not obvious what to wade through.) Thanks! It’s from the American Community Survey. It’s updated on an annual basis. 1. The decrease is small and far from definitive. Compare it to the previous ten years. 2. Census data is not taken except every 10 years. Interim data is calculated, so this could be just somebody in the census office decided commuting was on the decrease. Again, likely insufficiently definitive to be drawing any conclusions from. Asking “why” is premature, as you do not have sufficient data to say that it has. Hi Mark – it’s from the American Community Survey which is updated each year. Sure, the decrease is small. My point is that in 2014 nobody would have predicted anything but a continued uptrend. Why would we have been wrong? The ACS is a survey, albeit a large one, but has all the potential for erroneous answers of a survey. Given the small size of the decrease, I am not convinced that there is a decrease to point to. It could be a modest plateau. Increases in % of population who cycle also tends to be extremely cyclical, with relatively short peak periods. People take it up and quickly abandon it. Given that tendency, even if there is a significant decrease, the small size of the decrease could mean that more new cyclists maintained the practice than is usual for cycling growth cycle. If, 4 years ago, one predicted a continuous growth pattern, then the most logical explanation is a lack of familiarity with bicycle usage and trends. I would counter that anyone in the industry, or involved in bicycle advocacy for more than a year, would probably not have made a prediction of constant growth in 2014. At least, none of the people I used to know through my cycling advocacy days, and none of the people in the industry I knew as a result of that. People who are new to advocacy make that sort of mistake all the time. I’ll stand by my point – there is insufficient data to say for sure there is a decline. If you dig deeper, and find corroborating evidence in some other way, I could buy that it might be a real phenomena. Bicycle sales trends might be useful. Historic growth patterns for cycling might be useful. While I’m not convinced that calling the trend a decrease is accurate, the conversation, or even just thought, generated by your post is a good thing, imho. Keep people thinking about it. @Mark – you could be right. If you can come up with a bet about those numbers being above a certain level in the future I’ll consider taking it. The ACS actually replaced the long-form census. Instead of 5% of Census respondents getting the long-form, it attempts to capture a 1% sample annually. Ideas: Electric scooters. Uber. Improving public transportation. Also – The Marginal Revolution link to your post will have comments. Ah – perhaps so. So you think I overestimated the irrational helicoper-ness safety fear, but underestimated the rational fear of motorists texting while driving. Safety is likely the #1 reason cited for not bike commuting, though I can see where oftentimes it’s a convenient excuse. Still, it’s a very real challenge and not only for adult commuters, but kids commuting to school and after-school activities. @Sylvia Some certainly do. I’d always assumed that cycling was dangerous until I started riding a bike. It’s always struck me as safer than conventional wisdom would have us believe. It depends, of course, on the city. I tried biking to work in dc. Soon after, I fell off my bike and broke my wrist. I think the uptick in biking is a function of it becoming more of a socially conscious, healthy, and just all around good thing to do. Then, gradually people have realized that bikes just pose much more risk than is necessarily warranted . I haven’t biked to work since. Bikes are often a lot easier to steal and do take up a fairly large amount of space. Texting and. Driving is scary. You missed the most important factor here, and one that was mentioned on Electre – the survey asks for primary mode of transportation, meaning that those commuters who bike 1-2 days or week to work, for example, are not counted. Anecdotally biking overall has increased, and I’m still a believer. More trips and more people are biking, though maybe the most frequent cyclist ridibg exclusively for transportation has decreased. I’d love to commute by bike into Chicago, even if it were for the “last mile” from the Metra, but the cold and snow make it difficult here in Wisconsin. Economy is improving so people are making more dough and – lets face it – biking is very inconvenient. People can afford newer cars that get better mileage. But, no, this is it: The millenial population bulge is aging out of biking. Safety + better/cheaper alternatives. No need to blame millennials and helicopter parents. I stopped biking to work 6 months ago after getting almost hit by an a-hole in a pickup truck for stopping at a stop sign then going on my turn. Most bicyclists here are a-holes who don’t follow traffic laws, and drivers hate that and don’t know what to do with bicyclists who do follow the rules. It gets confusing and dangerous. Plus, every once in a while critical mass goes through town and pisses off the whole city. Biking is fine for select routes, but too dangerous and inconvenient to be practical. @Grover – do you think cycling is getting more dangerous over the timeframe mentioned in the post? Would be interesting to look at crash data to see. Bicycle separation (on some roads) makes those “left hook” and “right hook” type crashes more common. I touched on this in my previous post: Do We Overvalue Bike Lanes? I rode 3 times a week about 15 years ago. Riding is a life-in-your-hands project. You NEVER take a drivers’ moves for granted. A driver can and will do the most unlikely thing at any instant. NOTHING can be assumed. I’ve was in two accidents where I flipped the bike and cracked the helmet but fortunately was not seriously hurt. One excuse that came to mind, when I asked myself why I never biked to work in downtown Durham (I live near the Tobacco Trail, so there’s a direct bike lane) is that it’s too hot in the summer. So, my theory (though I doubt it plays a larger role than any theories of yours): global warming. If true, it might eventually help the Chicago commenter, sadly. Hi @Tyler – I thought about that too but dismissed it for the same reason – that so many areas of the country will likely see increased bicycle commuting when warming occurs. Laziness (sloth), coupled & difficulty changing embedded habits or routines. Or, question of sleeping in another 10 minutes, or allure of a warm car. One thing that isn’t on your list, but should be at least looked at is commute distance, and any changes thereto. That is: have commuting distances changed in this same period? @gregory – this is a good point. I tried to find some data on commute distances over time. It looks like most of the data is available as commute time in minutes which can be confounded by congestion. Distance and time would be nice to have. Your suggestion would point to yet another reason to try to eliminate more local zoning laws. To Greg’s point, I just started commuting by bike this year. It is ten miles one-way and I have to put on my road bike gear and use some effort to get to work in a reasonable amount of time. Most potential bike commuters, on the fence about considering it, would not like to arrive at work sweaty and needing to change clothes. More amenable road infrastructure would help here as well, but that seems like wishful thinking. Good post but I encourage you to explore the category on “taxicabs, motorcycle, and other means” since this would likely include a phenomena that you completely ignored…the introduction and peak of ride-hailing with companies like Uber and Lyft. Thanks! Hi @Alejandro – thanks for the comment. I thought about Uber and Lyft as a reason and eventually ruled it out. My thinking was: how many people commute to work 70%+ of the time using ride sharing? Maybe a few but it seems like most people use ride sharing like taxis – for occasional trips, not routine, everyday commuting. Maybe I’m assuming too much there – perhaps it’s worth a look. In Boston, a number of friends consistently use or have used Uber/Lyft for last-mile commuting on a regular (4-5 times a week). I’d point to that as the #1. Biking was the most convenient mode, and offset walking, but now that Lyft can get you there as quickly while you’re safe and warm and can be working/on your phone, it wins. I commuted by bike for years until the stress of distracted drivers wore me down. Then it was back to transit, more walking, taking Lyft/Uber, and actually, a boat. I’d be curious about trends of commuting by boat, as many American cities are situated on waterways. This question is an interesting one. You may know that Forester (“Effective Cycling”) was strongly of the opinion that bike lanes are a bad idea. However, cycling advocates and traffic planners have almost universally concluded that Forester was wrong. Personally, I still don’t buy that he was, but that has been the way that cookie has crumbled. There is one additional caveat I used to have in such discussions of the pros and cons of bike lanes: cost. If you are willing to spend the dollars for cycling infrastructure, as the Dutch did after WW2, then a separate cycling infrastructure makes great sense. What has surprised me, over the past 30 years, has been the governmental willingness to (occasionally) do exactly that: i.e. spend big bucks on cycling infrastructure. That willingness has exceeded what I thought would ever happen back then. @Mark – all good points – thanks for reading. Yes, I understand what you mean about the cookie having crumbled. It doesn’t make it good for cycling though. Another downside to bike lanes that I’ve noticed since writing that post: you’re more likely to see people riding a bike in the wrong direction when a bike lane is present. I’ve noted this multiple times in my hometown. A topic for a future post. Dave; my last reply was to your comment referring to a previous blog post about overvaluing bicycle lanes. Sorry, I thought the comments would be threaded! 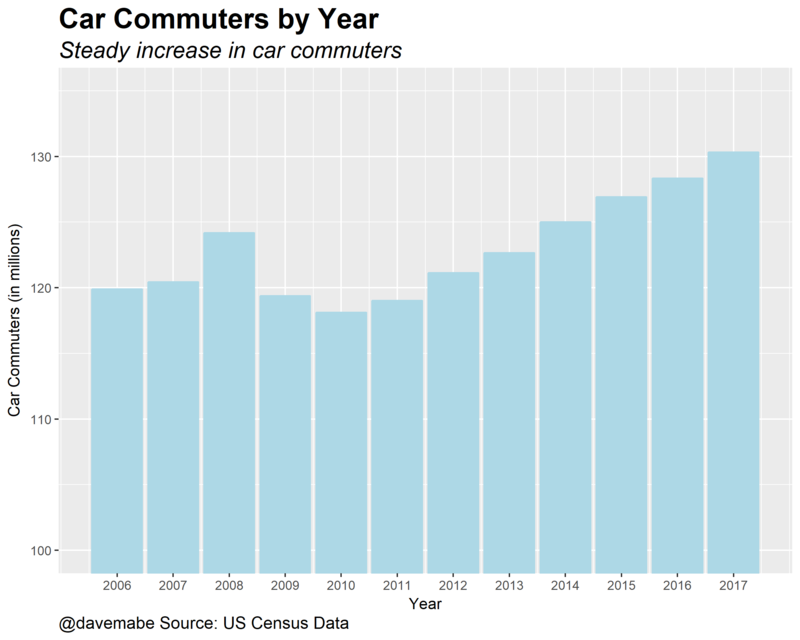 Possibly driving has gotten cheaper or more accessible in more ways than just lower gas prices — relative to income, availability of subprime auto loans, and (already mentioned) ride sharing services? Regarding relative to income, is bicycling as a % of commuters counter-cyclical? There was also a dip in total 2008-2010 but just eyeballing the graphs, there was a greater dip in car commuter totals, presumably both driven by recession. Another factor not mentioned yet above: cycling-friendly locales have gotten much more expensive in the last several years. Anyone who can afford to move into such a place can afford a car. @Mike – that’s an excellent point. Like @gregory’s point above, this could be another consequence of local zoning laws. Thanks for commenting. Probably the effect of helicopter parenting occurred when the child was going to school. I’ll bet that most cycling commuters had experience bicycling to school. 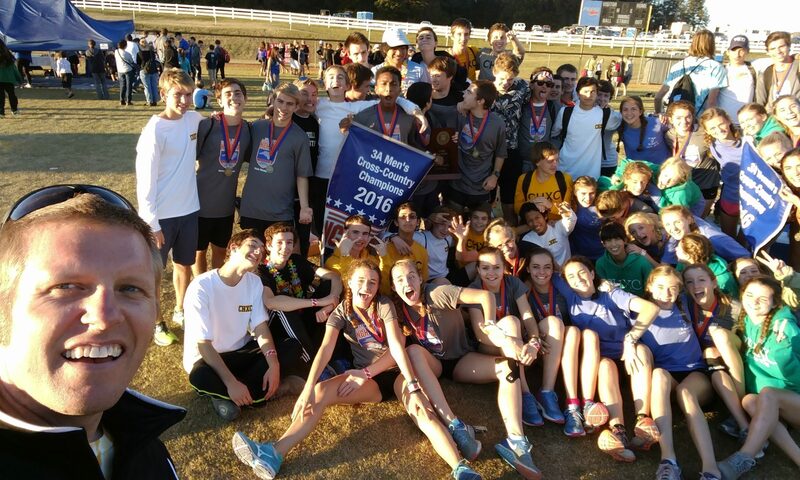 Now, just about every kid is picked up in the carpool line. Any data on age distribution of cycling commuters to support or oppose this conjecture? @Steve – one other person suggested looking at the age of cycling commuters to determine the same thing. That’s an interesting thought about the connectedness interruption. Thanks for the comment. Consider that the distance people need to travel for work. Particularly as the costs go up in urban areas and people more likely to want to cycle are pushed ever further into the suburbs and surrounding areas. For all the hype, what if the commitment to/investment in cycling in North American cities has actually been mostly underwhelming and doesn’t provide a reliably safe and convenenient option for normal risk-averse people? Take a look at the website below for an answer as to why people in the Netherlands cycle so much; then ask if any US city’s ‘working hard to promote cycling’ has resulted in anything remotely comparable in America from 2014 (or earlier) to today. I would say that bicycle commuting has plateaued because the vast majority of people simply don’t have the WILL to do it every day. It’s a lot easier to get in an automobile or a public conveyance when it’s raining, hot, or cold, and of course those methods of transportation require zero physical fitness. If people that are bike commuting live in a temperate climate, there are going to be winter periods when they can’t ride to work unless they are a total hammerhead, and the habit of getting on their bike every morning will be broken. Again, it takes a force of will to get back in the saddle in the springtime, and most modern people are pretty soft. I have been riding for over 50 years, including as a bicycle commuter, and have never had an accident with a motor vehicle. I have however found myself bleeding on the pavement because of black ice, sand, gravel, and uneven pavement. Cycling is more dangerous that riding in a car. It just is. If a person can’t accept that fact, they probably shouldn’t be riding anyway. I think working from home is a big part of it. I work from home and while I take 10-20 mile rides most days, it isn’t commuting. I’m planning on commuting next year when I am in the office, but that is dependent on finding showers somewhere. One factor, as the urban cores become increasingly expensive to live in, people move further and further out, making bike commuting less and less viable. Not sure why I don’t see housing cost as factors in many of these lists.